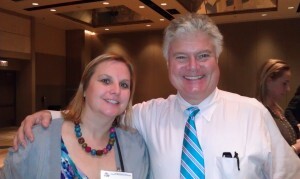 Lunch with Dr. Ned Hallowell, author of Driven to DistractionLunch with Dr. Ned Hallowell, author of Driven to DistractionAs the coordinator of CHADD of SJ Chapter I attend the conference each year and return inspired from my experience and participation. This year I had the opportunity to have lunch with Dr. Ned Hallowel, author of 'Driven to Distraction." Dr. Hallowell is a international expert in the field of ADHD. Dr. Hallowell graciously shared his in-depth knowledge and talked about how he is in the business of unwrapping the gifts of ADHD. He noted ADHD is not a gift but people with ADHD have gifts just like others do without ADHD. Creating Better Tomorrows moving forward to help those impacted by ADHD and surrounding issues. Timothy Wilens, MD, Harvard Medical School discussed the challenges of youth with ADHD, ages 15 -26, and brain growth during these years based on a study of young adults. The study indicated the frontal lobes of the brain showed large changes up to the age of 30, this is great news! Parents, in time your children will develop 'executive functioning skills' which are crucial to life success and independence. As your child continues to develop and move through this phase there is an increase of risk taking behaviors and substance abuse. However, with the proper medication, coaching, and treatment these behaviors can be decreased with ongoing support. For years there has been a misconception about this topic between the two leading experts. A lively and informative debate set the record straight! This was a wonderful explanation of how ADHD is a very serious disorder and not a gift, but that doesn't mean those with ADHD are without talents. However their talents are in spite of ADHD not as a cause. Dr. Ned Hallowell spoke about how the founder of "Jet Blue" Airlines who has ADHD made millions of dollars in one day and instead of celebrating went home feeling like a failure and high school drop-out. The toll ADHD takes on children and adults continue to follow them despite their successes. Parents need to provide ongoing support to build self-esteem. At ADDvantages we provide this support, you are not alone! As many of you know I am passionate about helping children achieve and feel good about themselves! Kidz Coaching Groups, Enroll Now for January! Remember, Success Tomorrow Starts Today to Develop Your Child into an Independent Self-Sufficient Adult!